Romney on Benghazi criticized Barack Obama for the lack of leadership in Libya. That there should have been more security at the U.S. Embassy in Benghazi. I would correct Romney. 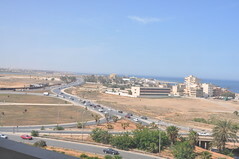 The U.S. Embassy is in Tripoli and , there is security at that U.S. Embassy in Libya. Ambassador Christopher Stevens wasn’t at the U.S. Embassy in Tripoli when he was killed. Romney is using this International Crisis in Benghazi to gain political points on the campaign trail. This show that Romney is not ready to be Commander-in-Chief. By revealing intelligence from Benghazi. Ambassador Christopher Stevens was in Benghazi because Libya’s new government was transitioning from Tripoli. And he wanted to be with the new government in Benghazi. Whenever the United States is in involved with an International Crisis. We all need to rally around the president and his administration. Whenever Romney is speaking against Barack Obama and his administration on foreign policy he is giving aid and comfort to the enemy. For Romney to say that Barack Obama is weak on foreign policy, he is repeating what our enemy would say. Who’s side is Romney on anyway? Does Romney think he is president pro-temp? Not in the U.S. Constitution. The Romney, Ryan policy is so extreme that he reject 47%, of minorities, women, students and, seniors. Romney says those people will not vote for him. Therefore he will campaign on giving millionaires and billionaires like him-self another tax cut. And increase taxes on the middle class to pay for the rich tax cut. Romney is campaigning on current events, like Benghazi and foreign policy. By saying Russia is our number one enemy. Even though we were attacked by Al Qaeda on 9-11. Romney, say China is our number two enemy because they are cheating on their currency. While Romney was out-sourcing jobs to China as the CEO of Bain Capital. Romney has accumulate over $250,000,000 while at Bain Capital and, pay less in taxes than the working class. Romney ‘s introduction into foreign affairs has damage him as a world leader. While in London, Romney undermine the readiness for the Olympic Games. While in Israel, Romney embarrassed the Palestinians. While in Poland, Romney refuse to answer questions by the news media. This showed his arrogance toward the working class around the world. Romney want to use his experience as a Vulture Capitalist,(feeding off employees he fired), while at Bain Capital. Now he want to be the president of the United States and one of the world leaders. Darrel Issa, a republican is a member in the House of Representatives who have put Americans lives at risk in Benghazi and the Middle East. This year along, Darrel Issa and the republicans have investigated 10 democratic in association with Barack Obama. Darrel Issa has been a representative for 11 years. But for the last 4 years he and the republicans would do or say anything to make Barack Obama a one term president. And to make political points for the republican party. And lose political points from the people. For the House of Representatives Committee on Oversight and Reform to investigate this crisis in Benghazi. It’s about two questions. Was this a terrorist act? Or was it a spontaneous attack in Benghazi, about an embarrassing movie by an American? In this investigation about how this could have been prevented was never discuss. The fact that four Americans lost their lives in this attack was not the main point of this investigation. Their main point was that this was a cover up by Barack Obama. Romney on Benghazi has put American lives at risk for compromising intelligence. This entry was posted in Romney and tagged al Qeada, Barack Obama, Benghazi, Christopher Stevens, commander-in-chief, Libya, Oversight, Romney, Tripoli, U.S. Embassy, united states. Bookmark the permalink. I am not aware of any other blogs/website/forums that cover this topic in a like manner. Keep up thhe good work! You understand, a lot of people are lookijg round for this information, you can aaid them greatly. account your blog posts. Anyway I will be subscribing for your feeds and even I success you get entry to constantly rapidly. much more neatly-favored than you may be now. You’re so intelligent. is something to do with Lady gaga! Your individual stuffs excellent.